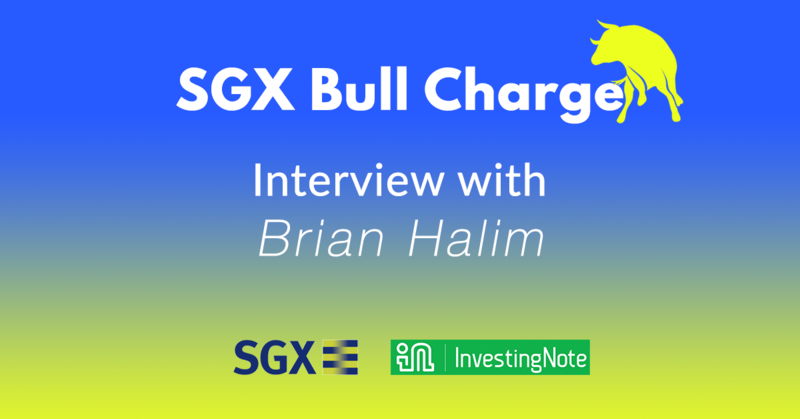 Recently, we got in touch with Brian Halim, one of the prominent financial bloggers here in Singapore and also a contestant of the SGX Bull ChargeStock Challenge, to understand more about his investing strategies, his philosophy, and what motivated him to get started in the first place. With less than a month to go, some of the top participants have achieved double digit portfolio returns within the timeframe of just 3 months. Impressive! For those who are wondering, the SGX Bull Charge Stock Challenge is only open to professionals and influencers in the finance industry. But the question we should really ask is, how did they do it? What is their investment or trading philosophy? Who inspired them? What styles of investing or trading are they using? We believe that every one of these professionals have different styles of investing, expertise in different types of securities and also have their own story to tell. Tell me more about yourself and how did you get started in investing or trading? Like most of the people, I am a normal employee who works by the day from 9 to 6 in the financial industry. During my free time, I would blog occasionally at http://www.foreverfinancialfreedom.blogspot.com to journal my thoughts on topics that are of my interests, i.e usually catered for investing strategy, portfolio management or personal finance. I am married with two young kids aged 4 and 1. I started investing sometime in 2010 not long after I started working and have been trying to fine tune my investing style to fit my needs. What type of trader or investor would you say you are? I mostly focus on fundamental investing strategy that look for companies that meet my certain needs and criteria. What are your best investment and worst investment since you started investing? My best investment would be in the property sectors in CDLHT and Guocoland a couple of years ago when I managed to scoop them up at their lows and managed to divest them near the peak when the sectors rebounded. Since my strategy advocates concentrated investing, the portfolio benefited a lot in terms of the absolute amount and gave a nice boost upwards. My worst investment in terms of absolute loss would be Comfortdelgro in the recent years, which I managed to divest too early before the sectors rebounded back after news of Uber and Grab merged. Looking back, I could have been more patient and have more conviction in the thesis but it’s a good learning platform to hone my skills. Do you have an idol in investing or trading? If so, what’s the most memorable teaching from them? There are probably too many to mention but I have always admire people who are deemed successful yet are willing to share to help other people and be humble about it. There are many of these people in the local blogosphere and Investingnote forum that I really look up to as my inspiration model. Do you have any rules to stock picking? I do have a few that needs to pass my criteria but in essence they have to be dividend yields that are above 6% (sustainable) and they have to be cheap enough for sufficient margin of safety. Can you share with us what is your current portfolio allocation? So far my liquid portfolio they are 100% in equities and I hold very little cash as explained the reason previously in my blog. What do you think of the current market conditions in Singapore right now? I actually think they are rather cheap which is also the reason why I am majority vested in the Singapore market. Which industry and sectors are you currently looking at and why? None in particular but was looking for business cycle that are undergoing trough right now and companies that can still payout a decent 4-5% yield at this trough situation. This means a lot of the negative news have been baked into the share price. What is your day-to-day strategy towards investing or trading? Do you implement a top-down or bottom up for stock picking? My strategy in investing revolves around a minimum of 6% dividend + around 4% of growth. Which is probably why these days I go top down to these companies that meet these criteria first then I will look into their valuations to see if there are sufficient margin of safety baked inside. How do you manage your portfolio, passively or actively and elaborate on it? I managed them actively but am enjoying a lot in the process of doing so. Even so, as I get more familiar each day with the company I am vested in, the time needed to monitor gets reduced sharply over time. If you can go back in time to change one mistake about your investing/trading journey, what would it be? My investing journey has been kind to me since I started so thankfully there isn’t a whole lot to regret about the way I perceive buying things. The only probable regret is I was not in the market when the big opportunities came during the GFC but again even if I can go back in time, I wouldn’t have a lot of funds to take advantage of it. Also what advice would you give to new traders or investors? Investing is a long term activity so the mindset has to be tuned to the right channel before you should put your funds into the market. Follow him to get the latest updates of his portfolio and all his transactions. To learn more on how to get started, we have other topics on investing here. Upcoming FREE Seminar: Meet Our Leaderboard Toppers!